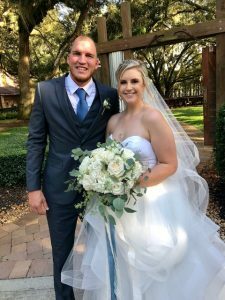 McKenzie and Joey were married at the Club Lake Plantation in Apopka, Florida. Orlando Flower Market provided the stunning flowers, Foodie Catering provided the delicious food, and Our DJ Rocks provided the music. Party Flavors crafted the wedding cake for the sweet bride and groom. The custom ceremony was presented by Rev. Glynn Ferguson of Sensational Ceremonies. TLC Videography and J. Lebron Photography captured the unforgettable moments of this beautiful weddings and Imagenius Photo Booths added some fun to the party. Congratulations the McKenzie and Joey!